“Nobody really eats the wedding cake anyway”…… Well I’m here to tell you that way of thinking has gone out the window. Gone are the days of hard icing and dry cake…this only happens when the cake is made too far in advance and without the love it deserves. The majority of couples I meet now are after a cake they are proud to serve to their guests, even as dessert, and the fresher the better (goes without saying really). Even sugar iced (fondant) cakes benefit greatly from being made as close to the BIG DAY as possible…without risk of course. Some couples even say “of course I want my cake to look nice, but it must taste amazing” Well, as a pastry chef, this is music to my ears. 25 years ago when I started my wedding cake journey, the norm was fruitcake and sugar icing with sugar flowers. Shortly after, mud cakes and butter cakes started to appear with white chocolate or butter cream icings and fresh flowers. Now there are any number of flavour combinations available for multi- tiered cakes as well as the ganache / buttercream layering on the inside. Just a few of those are: white chocolate raspberry, coconut lime, mango coconut, choc hazelnut, lemon and elderflower, orange almond, raspberry and lemon butter cake as well as choc fudge cake, a super moist, chocolatey, lighter than your average mud. The rise of the semi naked cake (careful if you’re googling that one) has brought about more rustic, organic looking wedding cakes. With fresh berries, macarons, gold leaf, chocolate drip effect running down the sides of the cakes and fresh flowers to match the reception flowers/theme. These are the cakes that guests can’t wait to get stuck into because they can see and smell all the grand deliciousness right there on the cake table. Mind you, when they see that same rich, moist, delicious cake on the inside of a sugar iced cake it is quickly devoured as well. 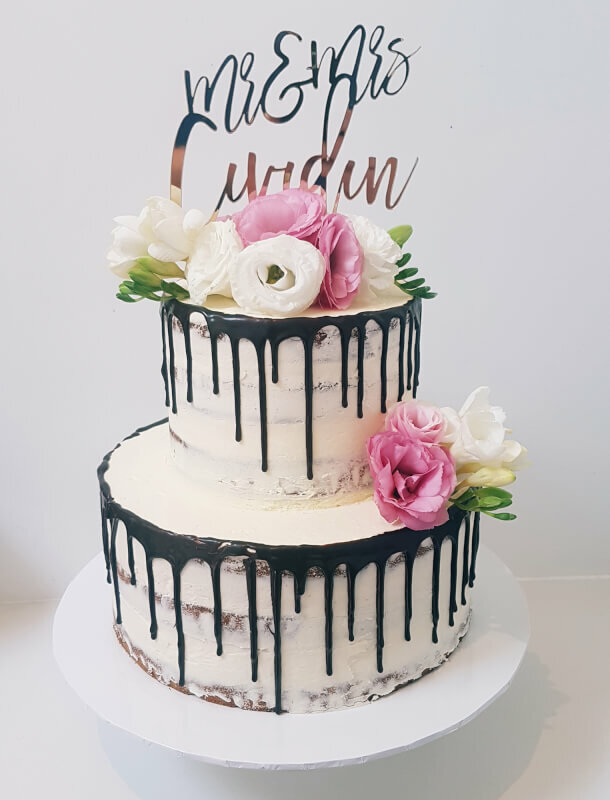 Essentially, when it comes to your wedding cake, think of the design/style/theme you’d like to have sitting there on the cake table next to you and your bridal party, and then, go crazy with what you’d like to serve them up from the inside. This post has been put together by Bill from Sweet Connoisseur. Click here to find out more about Bill and Sweet Connoisseur.